CocoNara Coconut Hookah Charcoal has been a hookah community favorite for many years thanks to their high-quality natural charcoals that lead to long hookah sessions and an emphasis on the flavor of the hookah tobacco. They are flavorless, odorless, and minimal ashing. The flat rectangle shape helps prevent the hookah charcoal from rolling off the hookah foil, making a session even less worrisome! There are no added chemicals, just pure coconut husk charcoals designed for smoking hookah! CocoNara Coconut Charcoal is available in a 20 Piece Box, 60 Piece Box, as well as a 120 Piece Box. 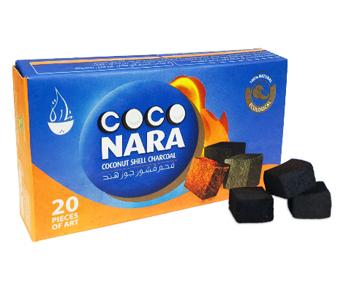 The CocoNara 20 Piece Box allows for you to sample this authentic Coconut Charcoal at an affordable price. It is recommended that you heat the charcoal on an electric stove, hookah charcoal burner, or open flame before every smoke.